Review of Jumpsoles and Strength Shoes – Do they really work? 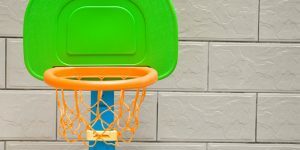 Home / Basketball Gear Reviews / Review of Jumpsoles and Strength Shoes – Do they really work? Jumpsoles are one of the icons of the vertical jump training world. 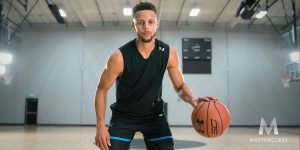 They have been around since the 90’s and claim to increase your vertical jump by 5-10 inches by adding fast twitch muscle fibers in the lower leg. In this review, you are going to find out if Jumpsoles actually work and whether there are better alternatives out there. Jumpsoles are basically a simple rubber platform you attach to your own shoes. They make it impossible to touch the ground with the heels thereby increasing the workload of the calf muscles. 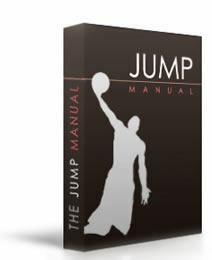 Jumpsoles come with a plyometric vertical jump training program delivered on DVD or VHS (yes, they are that old). There are two different versions: the plain Jumpsoles or the advanced version (with included Proprioceptor System) and cost a bit more. 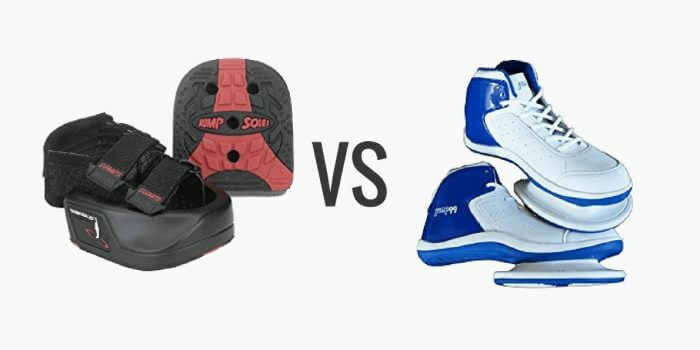 The difference between strength shoes and jumpsoles is simple. While jumpsoles attach a rubber platform to your own shoes, strength shoes already come with a pre-attached platform you can't remove. The training philosophy behind the strength shoes is identical to the philosophy of the Jumpsoles. 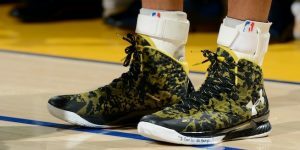 As you are forced to do your exercises on the tip of your feet, your calf muscles get a heavy workout theoretically increasing your vertical jump. The Jumpsoles come with an 8-week training program of specific plyometric exercises. You perform these workouts twice a week with the rubber platforms attached to the front of your shoes. You can check out the complete training program here. Exercises have a wide range: 1-foot jumps like skipping, fast two-feet jumps (like lateral cone hops), and slower, two-feet jumps (like box jumps). These exercises are similar to the exercises in many other vertical jump programs and are proven to increase your vertical jump even without the addition of Jumpsoles. You will feel a bit awkward when you train with the Jumpsoles for the first time. They are quite heavy and uncomfortable, and the additional weight is very distracting especially for one-foot jumps. So, why should I use the Jumpsoles? The difference between doing the prescribed exercises with or without Jumpsoles is the increased intensity for the calf muscles. But, does that even make sense? Vertical Jump height is determined by the fast extension of 3 different joints: ankles, knees, and hips.This so-called triple extension is a motion pattern involving a lot of different muscle groups like the feet, calves, upper legs, glutes, lower back, and even shoulders and arms. The calves are only estimated to contribute between 10%-20% to the vertical jump height. 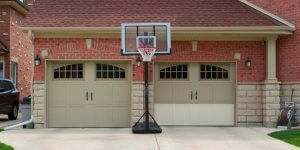 Other muscles (like the quadriceps) are much more important and contribute up to 50% or more to jumping ability. This varies depending on your jumping style (one-foot jumpers depend more on the calves, two-feet jumper less), but it shows focusing on the calves might not be the best idea. If you want to improve any athletic ability, you want to do exercises that closely resemble the actual movement for which you are practicing. By only jumping from your toes, your body might actually “forget” how to jump using your heels as well. By training with the jumpsoles, you will become very good at this very specific type of jumping, but you still have to translate your new skill back to regular vertical jumping. 3. Jumpsoles can be dangerous for your ankles. The elevated position of your feet during Jumpsole training (or strength shoes) leaves your ankles exposed to lateral ankle sprains. You have to be very careful when doing the exercises so you don’t trip or slip and hurt your lower feet. For an additional $30, Jumpsoles come with so-called Proprioceptors. These are little plastic plugs you attach to the bottom of the Jumpsoles and further increase the instability of your feet. 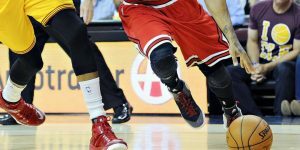 By training with Proprioceptors, you are supposed to strengthen your ankles reducing future ankle injuries and improving efficiency during take-off. While I believe you can benefit in the long term from this training, you also have to be very careful during the training to avoid injury. No, not really. While training with Jumpsoles will probably increase your vertical jump, I wouldn’t necessarily attribute this to the Jumpsoles themselves. You could probably see similar results simply by following the simple plyometric training program that comes with them (but without actually wearing the Jumpsoles). 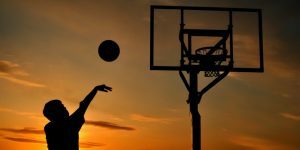 There are also more recent and cheaper vertical jump training programs that will do a better job at increasing your vertical jump without the added risk of ankle injury. 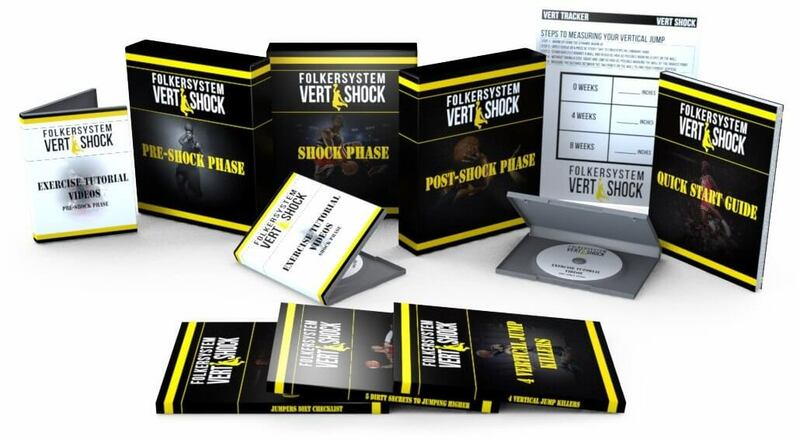 Today, unlike in the 90s, there are proven vertical jump programs based on hard science, years of undeniable proof, and sound training principles that don't rely on gimmicky rubber platforms or strength shoes. Watch my personal results her﻿﻿e. Jumpsoles and strength shoes are from another era of vertical jump training. There is a good reason you see them less and less in the gym. While they do work somewhat, there are far better options available these days. I wouldn't want to waste my time and money on gimmicky equipment that has little added benefit but significant injury potential. Exactly. You can stand on the balls of your feet without the jumpsoles and do the same exercises. If your subconscious mind knows you don’t have a heel to stand on, your center of gravity will have to move forward so your weight is over the balls of your feet. You don’t need the strength shoe to do that.